Ahead of last weekend’s event, all of my training went to plan. On Tuesday I did a 20 minute flat out speed session on the treadmill, then spent some time stretching in the gym afterwards. I’ve been suffering from very tight ITB and illiopsoas muscles, so I’ve been trying to stretch them a little more. I’m gradually increasing my speed each week. I covered 4.5km in 20 minutes last week. My aim is to cover 3 miles in that time; which is 4.82km in 20 minutes. Might not sound like I have much to gain, but I’m not really a fast runner, so I thought sure I’d find it tough. This afternoon I ran at 13.6km per hour for 15 minutes, then increased it by 0.2kph every minute (and sometime half minute) until running the last minute at 15kph. I covered 4.6km in 20 minutes today. Come 4 weeks time, I need to be averaging over 14kph for the whole 20 minutes to beat my target time. If I can do that then I can definitely say I’ll be at my fittest ever. I'm well on course to do that and maybe more I think. On Wednesday I ran back from the London office to where I was staying, doing a 10 mile route. I run Wednesday at a tempo pace; not flat out of course, since I can’t hold that kind of pace for 10 miles, but rather about 80%. I averaged a little under 8.5 minute miles, with almost 500ft ascent. It’s a gradual climb all the way to Hampstead, with no downhill whatsoever. This isn’t too bad when you factor in all of the traffic and road crossing in central London. I then set off at 6:15am the following morning to reverse the route, but not knowing my way around London very well I took a wrong turn and added an additional mile onto the route. I did about 11 miles, and ran in with a backpack of around 3-4kg. I ran it at an easy pace, just getting used to carrying weight again. On Thursday night I did my usual strength and stability workout, and rested on Friday ahead of the weekend event. I drove to Mytholmroyd, only just arriving as all of the 300+ people taking part were filtering outside for the start (half runners, half walkers, pretty much a straight 50/50 split I believe). I quickly registered and dashed back outside as everyone was disappearing along the road, and then onto a path besides the railway line for the first mile, which is totally flat. Below is the route map and rollercoaster hill profile as you can see. The route had undergone a late change, making it almost 0.5 a mile shorter; this was due to very deep lingering snow drifts on one part of the course. I was a little behind, so I tried to make up a little time on the flat first mile, knowing that there is then a bottleneck. There is quite a steep climb which is on a single file path, which more or less everyone including me slows to walk. You certainly get to know what your lungs are for quite early in the race with The Hebden. The climb continues for a few miles, though much less steeply after the initial ascent of about a mile or so. Then comes a welcome descent, some of which is on the road before another small climb to up checkpoint 1. This photo is a few miles into the run, heading up towards the building on The Hebden race logo. It’s a mill of some kind, but I’m not sure what for. Cotton maybe? I’m sure a local will let me know! In my haste to get ready in the morning I had poured some electrolyte into a camelback in my rucksack, but had not tested it, and only realised when I started running that it had clogged up. I didn’t want to waste time unblocking it as I ran, so I just left it and carried it all the way round; totally unused. Very annoying! As a result I had to rely on taking a cup of two of water or orange juice at the checkpoints as I went, as well as the odd snack. I did carry a few snacks myself, but I had eaten a good breakfast and a pot of rice pudding in the car just before the start, so felt fairly well fuelled. I carried the rucksack I will be using in the Atacama Crossing with 3kg of weight from start to finish. This coming weekend, I’ll increase it to 5kg. After the first checkpoint, there is a gradual descent over fields and footpath, and then a small climb along a forest track alongside a river. 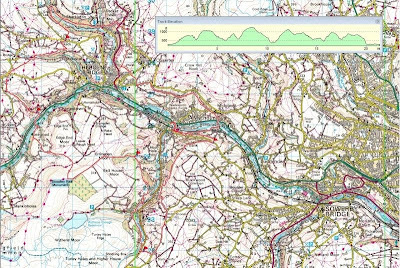 The track eventually goes down to a river where some stepping stones take you over the river and then the route climbs gradually through the woods, then up a field-side track to checkpoint 2. It was quite foggy up on the fields by checkpoint 2, and I did try and take a few photos, which don’t really do justice to how nice it looked. It was fairly cold, with a few lingering snow drifts along the field boundary’s, and a light ground frost as well. The Hebden route is really just a rollercoaster ride. It’s either heading up, or heading down; only the first and last mile are flat. After checkpoint 2, the route goes over another small stream and then descends into checkpoint 3, where I grabbed another cup or water and some Stollen before heading straight back out. I was in and out of all of the checkpoints in under a minute. After checkpoint three the route crosses a railway line and road and then there is a long climb, initially walking as pictured. Normally you get great views as you climb up in the rough direction of the Stoodley Pike Monument, but today it was just fog. I got fleeting glimpses of the monument as I climbed, but failed to capture a decent photo. I think the climb is around 1000ft, it gets easier to run it as you get nearer the top. There is a mile long gentle climb and then descent before you hit rough steps cut into a hill. It descends into a wood, a section which is always enjoy as it’s very much like the terrain I run on when at home. I can descend pretty fast on this ground; enjoying springing over the twisted roots, leaping and sliding over the big patches of mud. Some people kindly let me past as I dashed through the woods, really enjoying myself. I exited the woods at CP4 and then headed straight back up again through more fields and woods, some of which was route marked thankfully, as the navigation can be a little tricky. I had caught up a large group of people over the last few miles and was having a chat with a few of them as I made my way through the next section of woods, and then a short sharp climb to CP5. It was after CP5 that the route change was made, and we were directed along a road, avoiding the area which had too much snow, to rejoin the original route about a mile later. I had caught up a girl who I recognised from one desert race, then she told me it was last year’s Atacama Crossing! I remembered her then! Too many faces and deserts to remember! We ran in fairly close proximity for the remainder of the race, helping each other out with the navigation. CP5 to CP6 is always a little longer than I remember, and even after CP6 which is probably less than 2 miles from the end, the navigation is still a little tricky. A few time the footpaths cut right across peoples gardens, and you keep questioning if you are really on the right route, even though you know you are. We speeded up a little over that last couple of miles and finished in 4hrs 28 mins. The route was 21.5 miles long this year. I’ll have to check on the elevation but I think around 4000ft. I was running about 12 min miles average, and was pleased to finish half an hour faster than last year. I was in need of the knee operation last year of course. A big thank you to all of the organisers and volunteers at the checkpoints and the events centre. There was a meal available at the finish, as well as hot and cold drinks. Unusually for me I struggled to eat, so just settled for some hot tea before driving over to Sheffield to see my uncle, who is a chiropractor. He spent 2 hours sorting me out! I have had a lot of stomach pain from tight IS muscles and hip and knee pain from my ITB. My uncle massaged then released by back. Worked on my IS muscle, which is a pretty painful process, essentially involving pressing several fingers deep into your stomach. He did a lot of work on my IT band which again was really sore. I got a full MOT, and despite a few bruises, now feel a lot better. I really needed that session ahead of the big one this coming weekend. A change of plan means I have planned a new ‘rough’ route from my house. When I stand on high ground about a mile from my house I always seen a hill in the distance. It is easy to spot because the surrounding area is very flat, and then this almost perfect circular hill rising up from nothing. I’ve decided I am going to run to it next week. Small problem is I can’t really figure out from the map exactly which hill it is or how far away it is! My suspicion is that it is either the hill on which Beeston Castle sits, or it is one of the Peckforton Hills in Cheshire. If it is Beeston Castle, then an out and back route is going to be in excess of 50 miles. It seems like a nice idea right now, but I may not think that whilst en-route next weekend. I plan to start in pitch darkness about 4am on Saturday morning, and run all day. I have no idea how long it will take, since I don’t know how far it is. I hope it will take no more than 12 or 13 hours but that really is a guess. I will take a 5kg pack and include a similar amount/kind of snacks that I will use on the long day of the Atacama Crossing which will likely be 45-50 miles too Because of the increased distance on Saturday, I won’t do two 11 milers in this midweek. I will scale those back a few miles, to maybe about 7 each way I think. So this is it, the big mileage week. If I can get through this then It will be technically all downhill (in terms of distance), but I still have lots of miles to cover and some events too. I'm really happy with my progress so far, let's hope it continues. Final news, the race distances for this years race have been announced today. 4deserts have today posted a link to a Google map of the Atacama course, which can be found on their website here. I have created the same map in Google Earth, which you can find here. Make sure you choose the 2010 file. Just before you get your hopes up, if you are taking part, the course map is only a very rough approximation. The checkpoints and camps are pretty accurate, but the paths between them are not the nice straight lines you see, it's all twists, turns, ascent and descent, wide arcs and switchback paths between the CPs. I recognise some elements from last year, so I know we are all in for a treat as the scenery is amazing.